Google Cloud Connect is a free tool from Google that easily allows you to save your important Microsoft Office documents to the cloud (Google Docs). After you successfully install the free add-in you will see Google Cloud Connect as above. How to use Google Cloud Connect? Using Google Cloud Connect can be a little tricky. To use Google Connect you will need to Log -In to your Google account. You can also have multiple Google accounts yo use with Google Cloud Connect by using the Switch account option. Make sure you select Manual option as you do not want all your documents to be saved in Google Docs. The Save location option is a local folder where all your documents will be stored to be used by Google Cloud Connect which is should be different other than My Documents folder ( tip). As soon as you click on the Sync button your current document will be saved in Google Docs provided you see Success. 1. 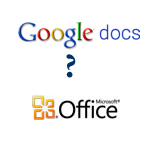 You have a copy of your important documents in Google Docs. 2. Multiple users can edit the same document provided they too install the Google Cloud Connect plugin and you give access to them to edit the document. These documents cannot be edited inside Google Docs. You will need Microsoft Office on your computer to edit these synced documents.